So, I am still in love with the whole magnetic nail trend and just when I think that the novelty is wearing off, I look down at my nails and remember that they still look pretty damn amazing. As I mentioned in my previous post about magnetic nail polish, there are a few brands that will be joining the trend and 17 is another one. The brand, exclusive to Boots, is the first one this year to get their magnetic polishes out to the general public so will probably nab all those excited customers first with their line up of polishes. There are 4 shades that 17 are offering in the genius names of - Blue, Green, Grey and Purple. Simple, to the point and definitely no sugar coating. These are already on sale in 100 Boots stores - see the official 17 Cosmetics Facebook page for more details - but don't bother hunting them down on the 17 stand. Nope, these babies will be on the brand spanking new "Latest In Beauty" stands in the stores mentioned where you'll be able to see what exciting products will be coming out soon as well the chance to buy them before they are on sale everywhere. 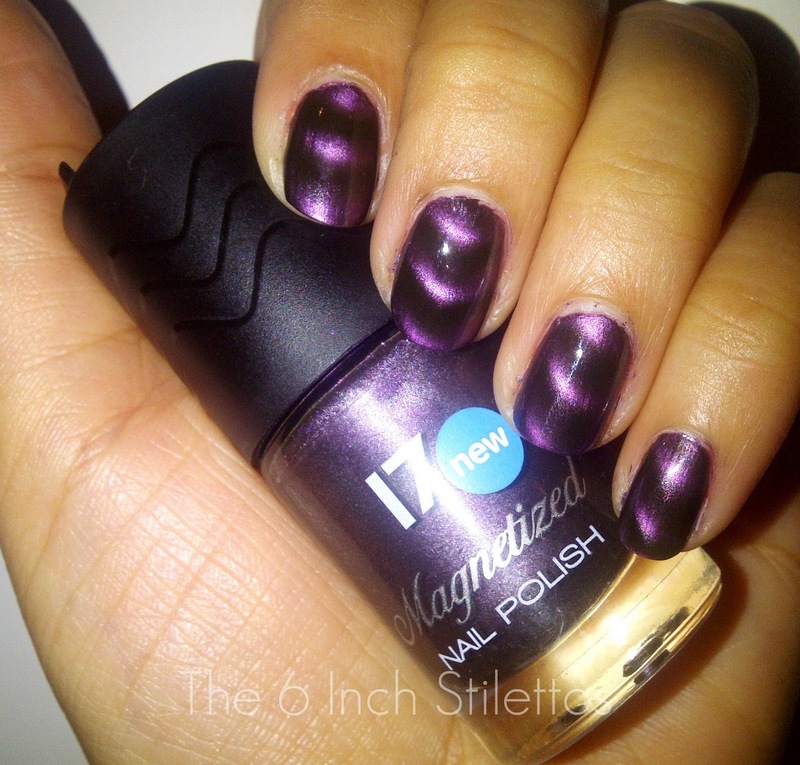 This is the purple one from the 17 Magnetized Nail Polish collection. I really wish that the purple shade would show up more on my camera but I don't have one of those flashy ones so I'll just have to make do with what I've got! The polish consistency was pretty much the same as that from the FashionistA range which I blogged about a few days ago and you will all probably notice that there is the same squiggly design on the lid too meaning that they came from the same manufacturer. I'm not going to try and fool any of you readers but I'm sure after you've played with one and then picked up another from a different brand, you'll agree with me when I say that all the brands were ripped off from the same guy. Also, I'm sure that this 'guy' is laughing all the way to the bank to cash in his purchase orders from all the big companies who have paid a whole lotta money to have something that will be available on the next shelf over. The wear on the 17 Magnetized Nail Polish is about 3 days which isn't too bad as that is on par with a normal nail polish so I'm a happy bunny. The consistency is creamy but not too thick so even though you could probably get away with 1 coat, I would definitely go for 2. I know the magnet trick can be a bit fiddly but I've found that if you do it at eye level so you can see that your nail isn't touching the magnet, you really can't go wrong. You can buy the new 17 Magnetized Nail Polish in 100 Boots stores now and I've been told that it is on offer from the original retail price of £5.99 down to £4.99 for a limited period only. What do you think of this colour? I've got another NOTD post coming up with the Filthy Gorgeous magnet polish so stay tuned!!! Wow thats a lovely colour. I wasnt a big fan of magnetised nail varnish before this post but they look really nice.